'In the last two decades, the history of the Counter-Reformation has been stretched and re-shaped in numerous directions. Reflecting the variety and innovation that characterize studies of early modern Catholicism today, this volume incorporates topics as diverse as life cycle and community, science and the senses, the performing and visual arts, material objects and print culture, war and the state, sacred landscapes and urban structures. 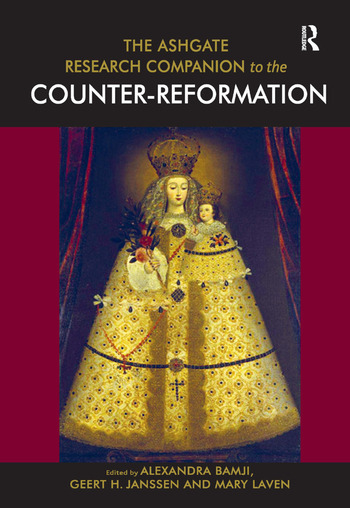 Moreover, it challenges the conventional chronological parameters of the Counter-Reformation and introduces the reader to the latest research on global Catholicism. The Ashgate Research Companion to the Counter-Reformation presents a comprehensive examination of recent scholarship on early modern Catholicism in its many guises. It examines how the Tridentine reforms inspired conflict and conversion, and evaluates lives and identities, spirituality, culture and religious change. This wide-ranging and original research guide is a unique resource for scholars and students of European and transnational history. Alexandra Bamji is Lecturer in Early Modern History in the School of History, University of Leeds, UK. She is a cultural historian of early modern Europe, with particular interests in cities, religion and the history of medicine. Geert H. Janssen is a Special Lecturer in early modern Dutch history at Oxford University and Fellow of Corpus Christi College. He is the author of Princely Power in the Dutch Republic: Patronage and William Frederick of Nassau (1613-64) and is currently working on a book about Catholic Exile in the Dutch Revolt. Mary Laven is University Senior Lecturer in Early Modern European History, University of Cambridge, UK. She is the author of Virgins of Venice: Enclosed Lives and Broken Vows in the Renaissance Convent, winner of the 2002 John Llewellyn Rhys Prize, and Mission to China: Matteo Ricci and the Jesuit Encounter with the East.